According to SamMobile, Smart Glow will get smarter over time. The feature will apparently first launch on the Samsung Galaxy J2 (2016) with three functions, namely 'Priority alerts', 'Selfie assist' and 'Usage alerts'. Priority alerts would allow users to assign colors to specific contacts, so you can see who's calling or messaging you without looking at the screen. Selfie assist would cause the LEDs to light up when a face is detected, and then automatically take a picture a couple of seconds later, making it easier to use the rear camera for selfies. So far, so similar to what we've already heard, but according to SamMobile these features will be further developed, with Selfie assist eventually helping your center your face by only lighting up parts of the ring when you're off to the side and Usage alerts would get additional alerts for storage, data and memory usage. Whole new functions will apparently be added too, with a 'Health ring' using the phone's rear camera and LED flash to monitor your heart rate. The role of Smart Glow in this is unclear, but it could perhaps indicate when a reading is complete. Then there's 'Weather ring', which would provide weather information by turning the ring a color that represents the current weather conditions when you shake the phone, though it's not clear how this will be any more useful than just looking out a window. But taken together these features could make the Smart Glow a very strong addition. 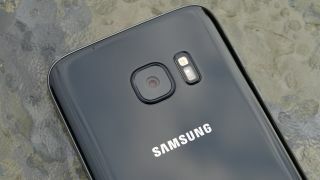 It's unlikely that modest hardware like the Samsung Galaxy J2 (2016) will get all of the additional functionality, but according to SamMobile the feature is expected to land on additional devices, such as the Samsung Galaxy S8.